Scientific Name: Citrus limon L.
Everyone knows the yellow, oval fruits of the lemon. You couldn't imagine a kitchen without them today. Botanically speaking, the lemon is a berry with its seeds enclosed in the fleshy pulp. The appearance and taste of this acid citrus fruit have given rise to many a proverb or saying. 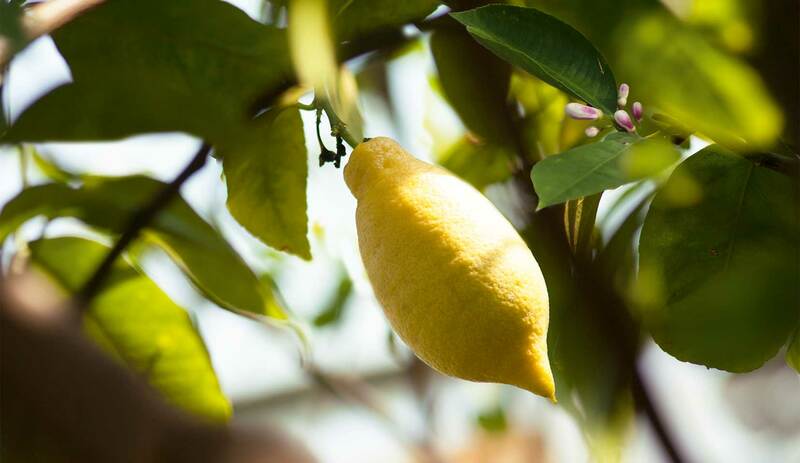 In our part of the world the lemon tree is only seen in orangeries or botanical gardens. In the warmer climates which the tree needs to thrive it reaches a height of up to fifteen feet. The dark green, leathery leaves have an aromatic scent. The flowers, white on the inside and tinged with deep pink on the outside, cover the tree throughout the year allowing fresh ripe lemons to be harvested three to four times a year. Of course the lemon is mainly used for culinary purposes. After bananas and grapes it is the most important fruit commodity. It is widely used as flavouring and aromatizer in many foods as well as in cleansing agents. In anthroposophical medicine lemon is used to treat allergic diseases. Citric acid is also highly valued by the cosmetics industry as one of the fruit acids or AHA (alpha hydroxy acids) recently discovered for their ability to reduce or prevent wrinkles. The citrus fruits owe their generic name "Citrus" to their ability to drive away moths and other pests with their strong smell. The Greek word "kedrus" was used to designate heavily scented woods that also kept away pests. For example, Arborvitae, Juniper and Cedar (Cedrus). Linguistic usage became blurred and the citrus fruits were left with the name. More than 4000 years ago citrus fruits such as the lemon were cultivated in China as objects of very high value which were initially reserved for the Emperor and other high-standing officials. Lemon trees were known as "golden-headed slaves" which brought riches and prestige to their owners. Alexander the Great became acquainted with the lemon, the "Golden Apple", during his Asian campaign (334-324 B.C.). However, it was only several hundred years later that the lemon reached our part of the world, probably being brought to Europe by the Arabs in the 10th century. shape, which occurs relatively seldom in nature, Esrog growers in Israel have the young fruits grow into special glass receptacles. Every year in September the carefully selected ripe fruits are then picked by hand, packed in hemp and shipped to Jewish communities throughout the world. The leathery skin of the lemon protects its juicy interior, virtually holding the moisture together and preventing it from flowing away. It demonstrates this art to human beings suffering from allergic diseases such as hay fever who constantly have to contend with a runny nose and tearing eyes. The lemon lends them its formative power. In cosmetics, lemon helps to firm the skin. For example, in Dr.Hauschka Lemon Bath and Lemon Lemongrass Vitalising Body Oil. Both have a firming action on the connective tissue and thus prevent cellulite and connective tissue weakness. In close weather or feverish illness Lemon Bath provides welcome freshness. Lemon Lemongrass Vitalizing Body Wash gently cleanses and revitalizes. Lemon Lemongrass Vitalising Body Milk tones and refreshes. In Dr.Hauschka Med Sensitive Saltwater Toothpaste essential lemon oil completes the antimicrobial properties.